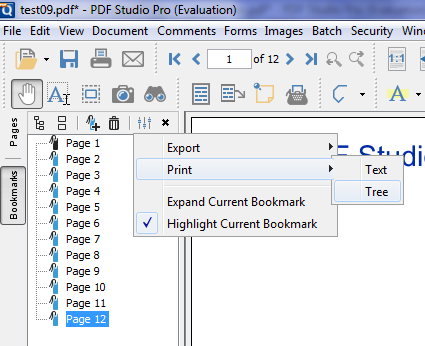 Q: How can I print the bookmarks in a PDF document using PDF Studio? A: In the bookmark pane, click on the the option icon in the bookmark pane toolbar and select Print -> Tree. If the option icons is not visible, you may have to resize / expand the scroll pane so that the whole toolbar is visible.